THE system of telegraphy invented by the Rev. Father Joseph Murgas, of Wilkesbarre, differs from the Marconi system principally in the code. It is what Father Murgas terms the shorthand of telegraphy. In it musical notes are substituted for the dots and dashes so familiar in the old code invented by Morse, and never until now improved upon. In a word, instead of the cumbersome dot and dash and interval of the Morse code, the Rev. Father Murgas has invented a method by which varying tones will express letters of the alphabet. These tones, clear, musical, pure and absolutely accurate, are received through an ordinary telephone receiver, and as each tone may be given in a fraction of a second and every one indicates a letter, messages which now take ten minutes may be sent and received in one minute. The difference in speed, however, has not been thoroughly tested. Father Murgas modestly says that his code is probably from five to ten times as fast as the Morse code. A company to exploit the invention is already formed. D0, RE, mi, fa, sol, la, si, do. 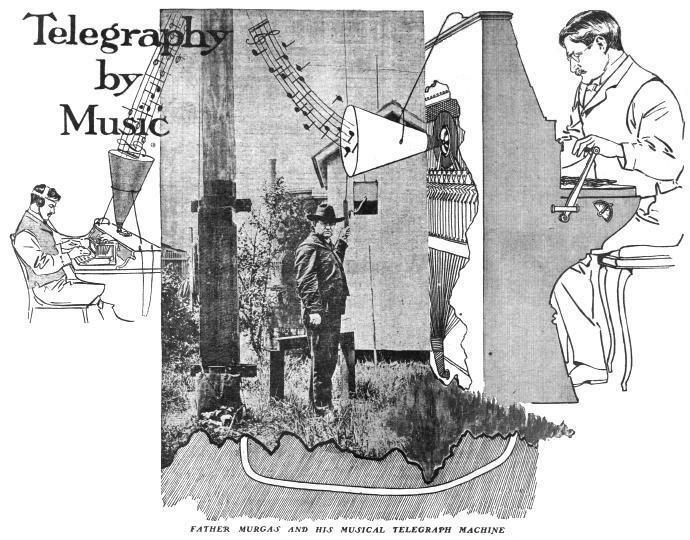 Real music is soon to be heard over the telegraph wires--or, rather, over the "wireless" wires. It will mean something more than a sentiment, too. For instance, a curious little tune will spell ruin to a cotton broker; another will carry a message of love to a waiting sweetheart from a fervent swain. Dots and dashes will have run their race if the system of telegraphy invented by a Catholic priest and patented at Washington on the 10th of May is only a fraction as successful as experts in telegraphy expect it to be. _______________________ THE REV. FATHER JOSEPH MURGAS is the product of a number of the most famous universities in Europe, a member of the Societe de Electrotechnique of Vienna, set upon the top of a hill in Wilkesbarre, catering openly to the religious wants of his devoted parishioners and secretly to the scientific wants of a world ever demanding improvements. For his parishioners he has erected a church, parish house and cemetery; for the world he has built a new system of telegraphy which promises to work wonders. Facts about great inventors, colored by time, modified by distance, never seem be remarkable as at first hand. That is why the work done by Father Murgas is remarkable. Glance at his history. He was born in Hungary thirty nine years ago, the son of a farmer. He was early destined for religious orders and scientific pursuits, and in the study of theology and electricity he did so well that very early in life he earned a name for himself in the priesthood and among the scientific men of Europe. Educated at Budapest, Presburg and Vienna, he completed his education at the famous university in Munich, taking honors. Every minute of the time that he could get during years he devoted to electricity and to the experiments of which he became so fond. Eight years ago he was sent to this country in orders and assigned to Wilkesbarre, Pa., where a number of Slavonic Catholics were without a pastor. It speaks vividly for the enterprise of the Rev. Father Murgas that in a short time he had erected a commodious church, a parish house and a little later provided a cemetery, and that his congregation now numbers eleven hundred or more and that he has collected $7000 toward the erection of a new church, the present one being too small for the growth of his flock. In a little room on the second floor of his residence Father Murgas has made a workshop, which is to-day crowded with apparatus, with cells, induction coils, batteries, jars and tubes and wires and a hundred and one other things he has used in his long series of experiments. Overhead, in the attic, is the larger apparatus, a network of wires, great copper balls, big batteries and all the impedimenta of a man who has constructed much and taken the best of what he has made to weld together a remarkable creation. A FIVE YEARS' STRUGGLE TO ATTAIN HIS PRESENT SUCCESS IN THAT little workroom he spent many hours of disappointment and fewer hours of the joy that comes from success. At first the work was hard enough to discourage a less able or a less energetic man. He had little money. With his salary and pay for the scientific articles he writes his income does not exceed $2000 a year. Out of that he has given nearly half to his inventions. Father Murgas started to work on the wireless telegraphy system five years ago, and although hampered from the outset by the lack of many things he struggled along, making what he could not afford to buy and saving money for what he could not make. With these drags the work was slow at first. Indeed, not until two years ago could he proceed with any degree of rapidity. Even now many things needed for the perfection of the invention are lacking, though in the main all are there. At present he carefully explains only what he had patented. From a desk heaped high with papers and plans he drew the diagram of the apparatus for sending and receiving messages, all the chief parts being, patented under the date of May 10, 1904. He is a smooth-faced, wide-headed man, with keen eyes. "I cannot talk much English, except electrical English," he explained, and he started into a clear exposition. "It is apparent, is it not," he asked, "that transmitting messages by the Morse alphabet is formed of dots and dashes and intervals? More time is required in sending a dash than a dot--so . . - -," he illustrated with his pencil. "Now it is not so that if the same dots and dashes and intervals were all translated into sounds which do not require so much time the savings would be considerable?" "Do, do, fa, fa," he hummed, eager to illustrate his point. "You must understand that the 'do' there represents the dot and the 'fa' represents the dash. The invention is just that. It expresses the dots and dashes by different tones sent rapidly and accurately. The instrument is regulated so that there cannot be more than a shade of difference between the tones. "Now," he exclaimed, having thrust the point home, "so far I have used only the two tones to represent the dot and the dash, but it is a most simple matter to elaborate any kind of alphabet from them, one tone being used to represent each letter of the alphabet. A series of tones will thus represent ordinary words. Indeed, it will be easy to institute a code by which just one sound could represent an entire phrase. "In other words, my system is the shorthand of telegraphy," he cried, "the idea expressing exactly what he wished to convey. NO CONFUSION OF TONES IF INSTRUMENTS ARE PROPERLY ADJUSTED AS I SAID, I have as yet used but the two tones to express the dot and dash, and I will illustrate how they are sent. I make the tones by impulses transmitted into interrupters. These interrupters take the current direct from the key, and the force of electricity going into them creates vibration. The intensity of this vibration creates a musical note, a sound wave. "This wave, increased in strength by a battery, is conveyed along a wire, and after passing through two copper balls and onto a highly insulated aerial wire it reaches the top of a fifty-foot pole, and from there is projected into the air a sound wave. "The waves follow each other with great rapidity, but the tones never become confused when the instruments are properly adjusted. "At the receiving station the sound wave travels from the top of a pole down a wire to the receiver, where it is caught by a sound wave detector and communicated to a diaphragm. The vibration of this diaphragm produced the same musical note transmitted from the sender and a battery magnifies it, and it is produced for the ear of the operator by an ordinary telephone receiver." Father Murgas followed this exposition with a technical description of each portion of the instruments and explained how they were operated, illustrating by diagrams and by the instruments themselves. He is all eagerness and enthusiasm and he is happy, not over the revolution his invention may cause in telegraphy or the fortune it will probably make for him, but because he is now able to demonstrate that the principles he conceived are correct. REMARKABLE SYSTEM WHICH PRESENTS IMMENSE POSSIBILITIES FATHER MURGAS has arranged with the company which is to put his invention upon the market for in payment of a considerable sum as an earnest. He was asked what he purposed doing with the money. "Oh," he said, "I do not know. There are two things I shall do with it. I shall aid in establishing a sisters' school for teaching the children of the parish, and then I shall use the rest in getting more apparatus in aid of further experiments." He smiled when asked if he had any more inventions in view. "Yes, there are several," he admitted, "but they are chiefly developments of my musical wireless telegraph system. It is practical as it is, but it is capable of being made much more so. I shall work for the company which takes my patents. I shall make them better." He shrugged his shoulders, as if it were a question of little importance, when asked the distance his message may be sent. "Across the ocean," he said, and, thoughtfully, "It will need a much elevated sending station and more power, that is all. It can go as far as Marconi's and farther. The number of sound waves is indefinite; there is no saying where it will stop; It is growing bigger all the time. Where do sound waves stop? There is no end to them." As Father Murgas says, the system he has invented presents great possibilities. Expert electricians who have seen it and who have witnessed tests declare it to be remarkable.